Use a spirit level to align all horizontal and vertical surfaces. Odd leg ‘U’ channels are plugged and screwed to the wall. 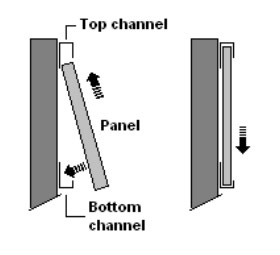 Insert the panel into top channel and push panel flush to wall then lower into bottom channel. Use bottom channels vertically as capping to cut wall ends. channels as capping to cut ends. 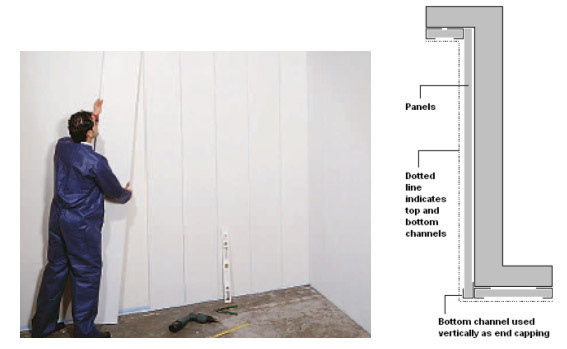 Use pop-rivets or screws to hold panels at ends as required.